When Bindi Irwin, daughter of late Australian wildlife expert Steve Irwin, announced on Good Morning America that she'll now be serving as one of SeaWorld's youth ambassadors, she wasn't alone. In addition to mother Terry and brother Robert, 15-year-old Bindi also had two other companions by her side -- a pair of Magellanic penguins, who reside at (you guessed it) SeaWorld. 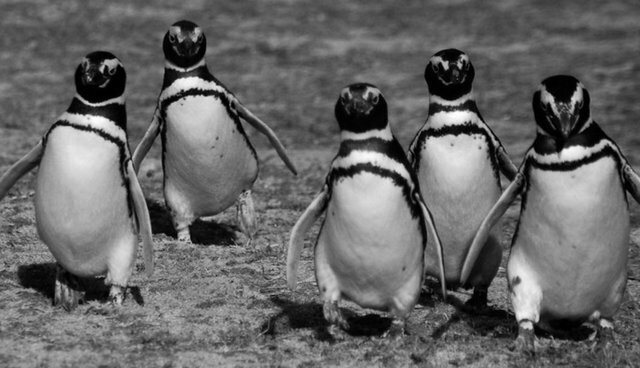 Actually, the penguins technically reside plenty of places besides SeaWorld: the park frequently counts on its "penguin ambassadors" to tag along at a number of public events, like restaurant cocktail parties or the New York Stock Exchange. But bringing penguins to public places can cause exorbitant stress for the animals, which are highly sensitive to changes in their surroundings. Captive penguins are already at greater risk for contracting various diseases, and the stress of traveling to and visiting new environments can further weaken the birds' immune systems. As Delcianna Winders of the PETA Foundation told The Dodo, entire colonies of captive penguins have been wiped out by relatively common contagions. Moving them around only increases the risk of exposure and -- potentially -- death. "Because penguins are so susceptible to fungus, bacteria, and parasites, it is imperative that they have clean air to breathe," Winders explained. She went on to say that it is "simply impossible" to meet this requirement when transporting penguins on an airplane, where recirculating air is often packed with contaminants. Given that penguins are native to the southern hemisphere, air travel is usually required to get them to public appearances. But the public appearances themselves can also pose threats to penguins. According to Chris Draper of the Born Free Foundation, the unnatural environments penguins encounter at human events simply cannot replicate any aspect of their lives in the wild. And those same stressors of changing environments and performance still affect penguins regardless of where they're raised. "We regularly hear the argument that, as the animals used were raised in captivity, it is somehow more acceptable to use them than their wild counterparts," Draper explained. But, he says, this simply isn't true. "Even if a penguin is raised in captivity, it still has the same basic social, behavioral, and physiological requirements as a wild penguin, and those needs simply cannot be met being moved around between environments." Our animal ambassadors travel frequently for educational appearances at schools, functions and media outlets to help inform the public about the plight of animals in the wild and to encourage people to care. These animals are well-cared for and are accompanied by world-class animal care professionals. Such public appearances do not cause stress as suggested. But these events often contain stimuli -- loud noises, flashing lights, hordes of people -- entirely absent from penguins' natural habitats, and it's difficult to believe that the disparity is lost on these bright creatures. Additionally, penguins are adapted to a unique range of temperatures, making climatic variation another important -- but often overlooked -- consideration. Bringing penguins somewhere so far north of their natural habitat (like New York City, for example) is -- in Winders's words -- "nothing short of cruel." So why parade penguins around at all? Sometimes it's under the guise of educating the public about penguins, which Draper thinks is nonsense. "What can be learned from seeing an animal so removed from its natural environment?" he asked. Draper makes a good point: it's difficult to imagine what penguins are truly like when they're visiting the financial district, or flying first class, or parading around a black-tie event. So, he concludes, they shouldn't be there at all. "Penguins are wild animals," Draper said, "and a wild animal is not something that should be available to ‘hire' on a whim."